The Government has announced that they will extend the higher instant asset write off threshold for Small Business Entities (SBEs) a further year until 30 June 2019. The threshold has been $20,000 since 12 May 2015 (2015 Budget Night) and was due to revert back to $1,000 on 1 July 2018. Although not explicitly part of the budget, it still seems to be the “hot topic”! The Government has previously passed measures to give corporate businesses with a turnover up to $50 million progressive tax cuts over the next 10 years. 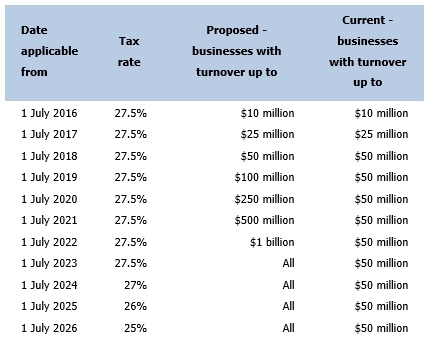 The original announcement in the 2016 Budget was that these tax cuts would apply to eventually apply to all businesses (as shown in the table below). Negotiation to get the legislation through the Senate is ongoing. The Taxable Payments Reporting System will be extended from 1 July 2019 for contractors in the Security Provider and Investigation, Road Freight Transport and Computer System Design and Related Services industries (previously it applied to the Courier, Cleaning and Building and Construction industries). This means that businesses operating in those industries will need to submit an annual report disclosing payments made to contractors during the year. This is a similar process to the Annual Payment Summary Report for employees. From 1 July 2019, businesses will be denied a tax deduction for payments to employees or contractors where they fail to withhold tax and there is a PAYG withholding obligation. This includes payments to contractors where the contractor does not provide their ABN. We will need more detail on what constitutes a “failure to withhold” but it will be critical to withhold the correct percentage of the relevant gross payment, rather than making the full payment to the payee. A limit of $10,000 will be introduced for cash payments made to businesses for goods and services from 1 July 2019. This will not apply to transactions with financial institutions or consumer-to-consumer non-business transactions. Director penalty regime (directors personally liable for company debts) to be extended to include GST, luxury car tax and wine equalisation tax. Previously this included PAYG withholding and Superannuation. R&D Tax Incentive changes for companies with a turnover of $20 million or more to link the rate of the offset with the percentage of R&D expenditure compared to total expenditure. Concessional (adult) marginal tax rates on distributions to minors from Testamentary Trusts will only apply where the income flows from assets originating from the Deceased Estate or the proceeds of the disposal of the assets originating from the Deceased Estate.